Are You Ready for Some Football Imaging? Editor's Note: Are You Ready for Some Football Imaging? Did you know the National Football League (NFL) has its own Web-based PACS? It maintains an EMR for its players, too. 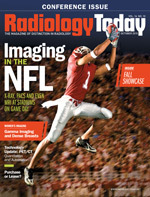 Those are two interesting details in Beth W. Orenstein's article, "Imaging in the NFL," on page 12. The former sportswriter in me wants to spin that into some wild controversy about hacking medical images and records to alter the betting line, or at least improve my fantasy football match-up this weekend. Of course, doing that would be simply making up a story. I remember from journalism school that fabricating stories is a bad thing. I also moved on from my fantasy football team, the Nasty Bunnies, years ago. Orenstein's story is a straightforward look at how the NFL and its teams handle game-day imaging for their players. From a football perspective, it's not intriguing stuff. From an imaging perspective, it's a good read about stadium imaging in professional football, which is mostly digital X-ray and PACS at the stadium. Onsite MRI really isn't that practical when you think about it. "If a player needs an MRI, he probably shouldn't be going back in the game anyway," Matthew J. Matava, MD, head team physician for the St. Louis Rams, tells Orenstein. I also know that Orenstein is a devoted Philadelphia Eagles fan. I'm certain that she really wanted to ask Matava about the knee of Sam Bradford, his team's former quarterback who is now an Eagle. Bradford's twice-repaired knee supports the high hopes Eagles followers have about this season. I, too, am one of those fans. For the record, Orenstein didn't ask; she's too professional for that. Also in this issue, we look at what's new in PET/CT scanners, where gamma camera imaging fits in as adjunct imaging in women with dense breast tissue, and some current trends in equipment purchasing. We also are ramping up for RSNA 2015 in Chicago. Next month features our RSNA Roadmap Issue that takes a look at the society's 100th anniversary. Enjoy the issue . . . and Fly, Eagles Fly.